Refuge du Pelvoux at 2704m is located on a rock shefl high above the Vallon de la Sele and on the southern slopes of Mont Pelvoux, one of the most iconic peaks of the Ecrins National Park. This hike from the popular destination of Ailefroide is a long one, taking upwards of 6-7 hours out and back, but the reward, in addition to the ever present beauty and wilderness of the Ecrins National Park, is a fantastic view that on a clear day stretches as far as Mont Viso in Italy! We were even lucky enough to get right up close with a family of Chamois that crossed our path well. Visiting Ailefroide right at the end of September was a completely different experience to the previous time we had driven through in August 2014. 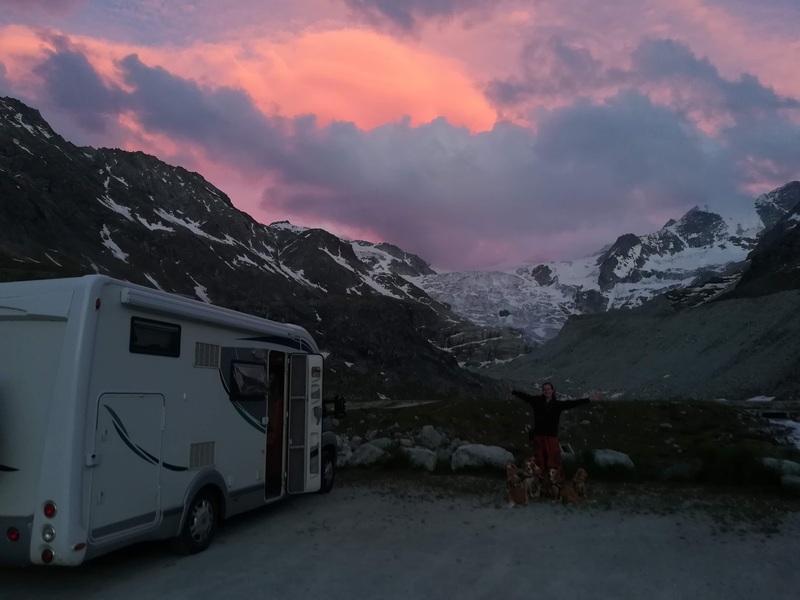 As a mecca for climbers and hikers during the summer months when we had last driven through on our way to visit Glacier Blanc and Glacier Noir from Pre Madame Carle the village had felt like one continuous campsite for several kilometres with tents and motorhomes everywhere. Now in early autumn the trees were shedding their golden leaves and the campsite was deserted, with just a few other cars in the car park we chose at the start of the route. Setting out in late morning the initially tarmac path soon reached the start of the hike, which initially shares the route with the way to the slightly lower but equally remote Refuge du Sele (2511m). However, we had chosen the higher of the two, a good 1200m further above our heads. The path began through forests, climbing gently but steadily and entering the Ecrins National Park proper before emerging into the Vallon de la Sele. There is just something about the Ecrins that just feels 'big' or rather 'huge' to us. It is a high set of mountains containing the southernmost 4000m peak in Europe (Barre des Ecrins), however, it is also something to do with the fact that the valleys here are relatively narrow and steep sided compared to the broader and more open valleys of the nearby Queyras meaning that as we stood surrounded by towering rock faces stretching more than 1000m up on all sides we just felt so tiny. It was a very moving sensation. The path up the Vallon de la Sele was quite easy to follow and tracked the river much of the way, although it was hard going underfoot with rocky paths that meant we had to focus on our footing most of the time. After around an hour or so we reached the fork in the path around 2000m which led to the two different refuges and we turned right up to Refuge du Pelvoux. From this point onwards the path began to feel like a never-ending series of switchbacks. Some were long, others were short, but as the rocky path traced its way up the steep mountainside it just kept on zig-zagging the whole way and all the time it was barely possible to look up and work out where it was going next. Also, as there were no signs until "35 mins" to go we had little idea how far we had climbed. It was a long and tiring ascent, however, looking across the valley the view was improving all the time, especially of the snow topped summits Pointe de Celse Niere (3429m) and Pointe de Riou Blanc (3372m). However, the relentless switchbacks had to end sometime and after around 4 hours of hiking from Homer we did finally round a bend to see the welcome sight of the Refuge du Pelvoux and the towering slopes of Mont Pelvoux beyond, and although it isn't possible to see the summit from here there was just a hint of the Glacier du Pelvoux visible. But the really impressive views were those that looked south-east and across to snow-capped peaks including the imposing and pointed summit of Mont Viso in Italy, and also looking westwards past the Refuge du Sele to the Glacier du Sele and Glacier de l'Ailefroide. Given that it was now past 4pm we knew we couldn't stay too long and our shadows were lengthening as we started downhill. Tired legs carried us onwards but without too much haste as we enjoyed the autumnal feel of the valley that was so still and quiet (we'd only seen 3 other hikers all day). Then we got a special treat as we neared 2000m and found a Chamois mother and 3 young grazing on the path ahead. They didn't seem bothered by us very much and even posed long enough for us to get some great images of them close up. Arriving back at Homer just after 7pm we'd been gone for close to 8 hours in total, although photographing Chamois accounted for part of that, but it had been a spectacular hike at a brilliant time of year where the cooling weather had been more than compensated for by the peace and tranquillity of the park in it's autumn glory.